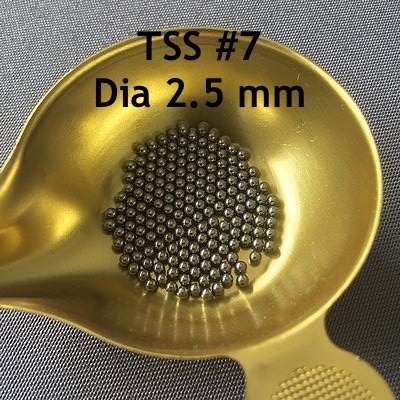 With the TSS #7 of diameter 2.5 mm we arrive in the balls to be adopted for the hunting of the geese. It is the lead equivalent of a ball of 2 at the penetration level which makes it a ball well suited to long shots because of its significant lethality. It can be used for shooting geese of all sizes. The balls of TSS # 7 (2.5 mm) are perfectly adapted to shoot geese up to 60 m. In fact, the 56 mm (required for Greylag Goose) penetration is reached at 63 m. The pattern density at 60 m remains of almost 2.5 impacts per dm² for a charge of 40 grams classic which is sufficient for a target that has a surface of the order of 2 dm². It is therefore a ball that will allow to shoot all species of geese within the limit of 60 m.
We can acheive longer range for the geese who are a little more fragile (pink foot, white front goose) but putting more load to have a more dense pattern density. I invite you to go on the blog to consult the table of the loads according to the desired game.